The information you obtain at this site is not, nor is it intended to be, legal advice. You should consult an attorney personally for individual advice regarding your own situation. Past case results afford no guarantee of future results because every case is different and must be judged on its own merits. Supreme Court Rule 4-7.1(c). All of our offices are routinely staffed by attorneys and/or paralegals during office hours but meetings with attorneys usually require an appointment to ensure availability. Supreme Court Rule 4-7.1(j) and 4-7.2(e). The choice of a lawyer is an important decision and should not be based solely upon advertisements. Supreme Court Rule 4-7.2(f). 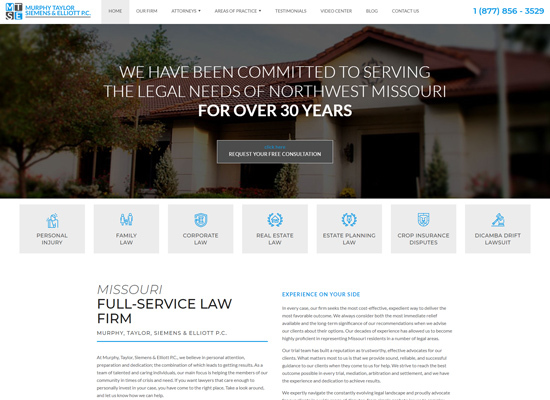 Advertising Material: Commercial solicitations are permitted by the Missouri Rules of Professional Conduct but are neither submitted to nor approved by the Missouri Bar or the Supreme Court of Missouri. Supreme Court Rule 4-7.3 (a). Our firm offers legal services on a “contingent” or “No recovery-no fee” basis, but the client may be responsible for costs or expenses incurred on his/her behalf. Supreme Court Rule 4-7.3(d). Neither the Supreme Court of Missouri nor the Missouri Bar reviews or approves certifying organizations or specialist designations. Supreme Court Rule 4.7.4.